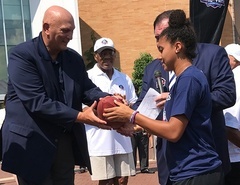 The Pro Football Hall of Fame, in partnership with the NFL, celebrated the kickoff to the 2018 Pro Football Hall of Fame Enshrinement Week powered by Johnson Controls on Wednesday, August 1 in Canton, Ohio. For the 19th straight year, the national celebration has begun with Play Football First Play during which 3,000 children form a human chain and pass a football along a three-mile route from the location in downtown Canton where the National Football League was founded to the front steps of the Pro Football Hall of Fame. Play Football First Play participants received a t-shirt, free admission to the Pro Football Hall of Fame, and lunch on the Hall of Fame grounds.